Gave her a full detailing, polish and wax, Sienna Red looks great in sunlight when its clean. I scored it some goodies off of craigslist. today cleaned up all the rust in the door jams and seam sealed them after. also on the rear left side lower part of the door ,the rust from inside the doors creeped to the lower outside part so I had to repaint that too. not too bad for using spray bombs. and for some reason only the drivers side doors were rusting. nothing at all on the passenger side doors. 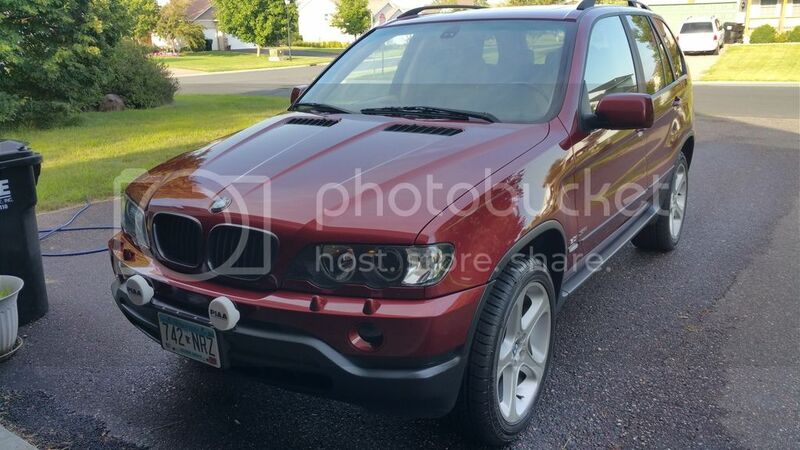 One my first upgrades since my used x5 came sans mats. The only thing about BMW mat vs weather tech is they are rubbery vs plasticy so they grab dirt. I wouldn't have it any other way. Spilled something in the mat the other day and simply pulled out and hosed it off. Helped somebody deliver a few hundred pounds of lumber from Home Depot. He was trying to put all on his Honda CR-V. Here's the pair of trucks just before leaving. My custom rack works better than planned for dimensional lumber. 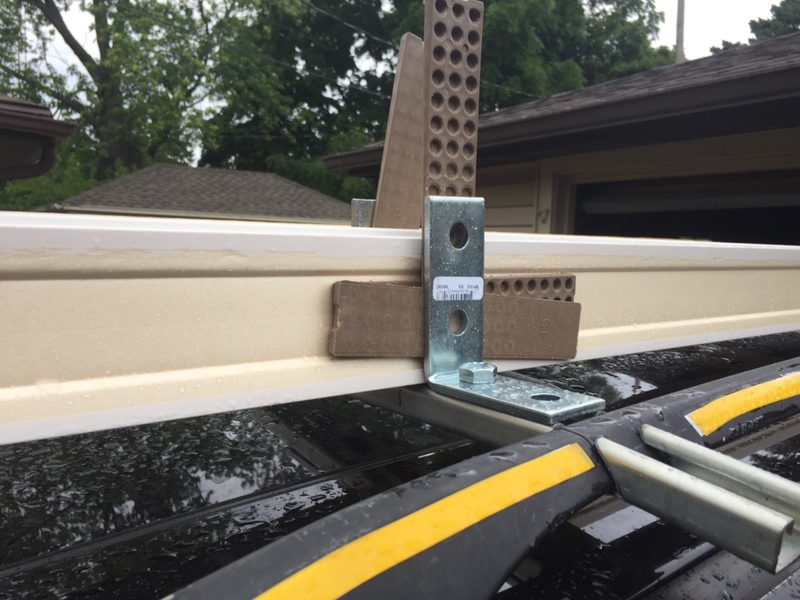 It has right angle brackets that are held tight with 1/2 inch bolts. I leave a little space at a slight angle for a composite shim and hammer that sucker in there tight. The load stays perfectly in place. The cross bar is a little bit flexible and takes some shock when hitting bumps. A close up of the system holding some baseboard. I've used a dozen methods to carry construction materials and nothing comes close to this one! I was surprised how well it dealt with the 16ft. 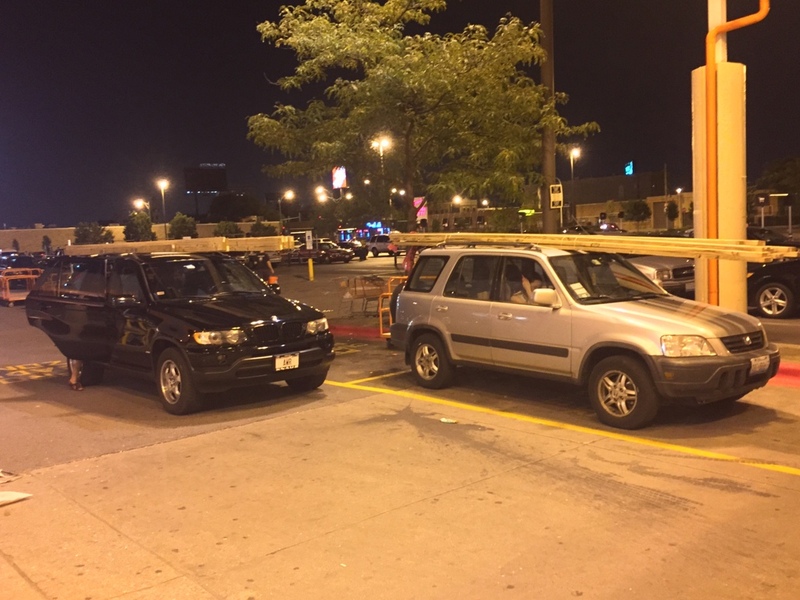 lumber since the cross bars are not even 4ft. apart. I designed it to carry 10ft. long conduit or 4x8ft. sheet material. today (well last night) I shouted at it !!! Front brake pads and rotors! Interestingly, Advance Auto Parts, Auto Zone, and CarQuest(pretty much Advance) all had the rotors for the 2001 X5 with just 6 holes. The 5 bolt holes and the rotor screw. I had to go to several stores to find the rotors with the 8 holes (+2 for the locating pin things). Other than that it was suuuuper easy. Not too happy with the Advance brake pads so far though. Not enough brake bite, although they stop fine. Swooped an E39 Msport wheel today off of craigslist for pesos. Also came with an airbag. The trim on it is in rough shape but that is easy to fix. Can't wait to get a new trim piece and install it. It is much thicker than the pre facelift sport wheel which is really nice.